Medal Depicting the Duke and Duchess of Anhalt, Oak Wreath, and Inscription Recognizing Artist Caroline Bardua for Achievements in the Arts and Sciences. 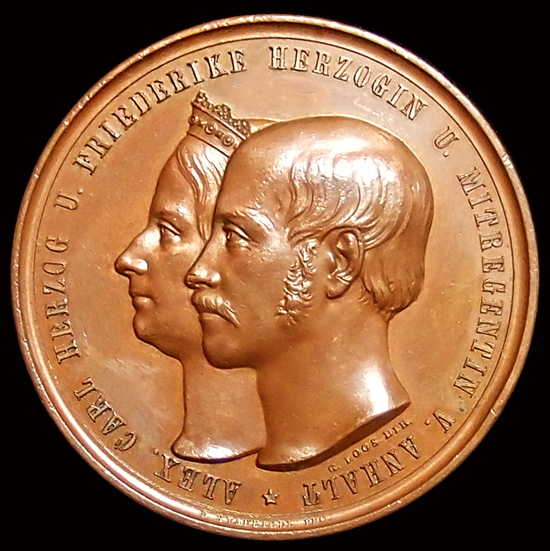 Depicted on the obverse of this medal is Alexander Karl, Herzog von Anhalt-Bernburg of The House of Ascania, and his wife Friederike Herzogin von Anhalt-Bernburg. The reverse of the medal shows a wonderfully detailed wreath of oak leaves. 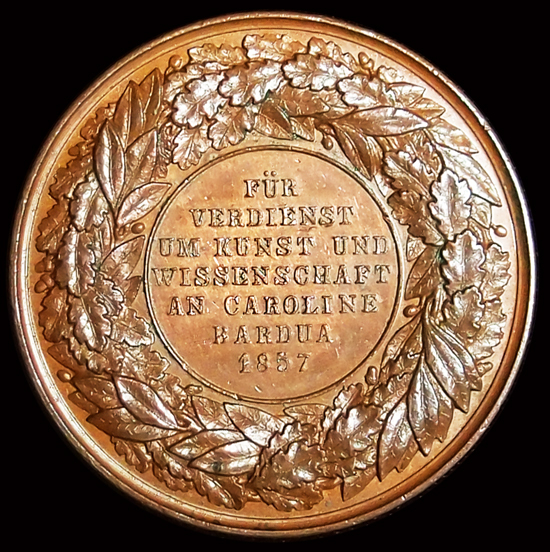 The inscription attributes the medal as an award given to the painter Caroline Bardua for her achievements in the arts and sciences. The Duchy of Anhalt-Bernburg was located between the Harz Mountains and the river Elbe, now part of the German Federal state of Saxony-Anhalt. Originally a part of the Duchy of Saxony in the 9th century, it became the county of Anhalt in the 12th century and by 1218 it had fully separated from Saxony and became the principality of Anhalt under Henry I. On his death, his sons partitioned the the principality founding the lines of Aschersleben, Bernburg and Zerbst. Over the years the principality would be divided, re-divided, or one would incorporate the other as one family line died out or another was founded. The policies of the different princes were marked, for the most part, by uniformity. Names changed and lands shifted by agreements made between the different lines. In 1806 Napoleon elevated the states of Anhalt-Bernburg, Anhalt-Dessau and Anhalt-Kothen to duchies. The first Duke if Anhalt-Bernburg was Alexis Friedrich Christian Herzog von Anhalt-Bernburg who ruled for 31 years. 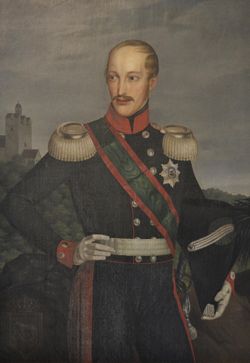 Upon his death in 1834, his son Alexander Karl became Duke of Anhalt-Bernburg. Born on March 2, 1805 at Ballenstedt, Germany, Alexander Karl became the Duke of Anhalt-Bernburg at the age of 29 and married Friederike Caroline Prinzessin von Scheswig-Holstein-Sonderburg Glucksburg that same year. Under his rule the duchy would expand as it incorporated the lands of Anhalt-Kothen upon the death of the last of that family's line, Duke Heinrich, in 1847. With land disputes resolved it would be under Alexander Karl's tenure that the railway would come to Anhalt and several schools for the underprivileged of the small duchy opened. By 1855 the Duke was suffering from what had become a debilitating mental illness and his wife Friederike was appointed as Mitregentin (co-regent), of the Duchy to be aided by Duke Leopold of Anhalt-Dessau. Alexander Karl and Friederike were avid patrons of the arts and had many artists as friends and in their employ. One such artist was the Russian born painter and writer Wilhelm von Kügelgen who was hired as a court painter. He was later appointed as chamberlain to the Duke serving from 1853 as his aid and companion during his years of decline. An accomplished artist and writer he gained further notoriety after his posthumously published book, Jugenderinneru-ngen eines alten Mannes (Youth Memories of an Old Man), became a favorite among the upper classes. Wilhelm von Kügelgen was the son and student of the great portrait and landscape artist Gerhard von Kügelgen. One of the more prolific and sought after portrait painters of his time. He painted many of the artists, writers, scientists, and leaders of the era including portraits of the Russian Tsar and his family. Obv. Alex(ander) Carl Herzog u(nd) Friederike Herzogin u(nd) Mitregentin v(on) Anhalt - Alexander Carl Duke and Friederike Duchess and Co-Regent of Anhalt / G. Loos Dir. / F. Staudigel FBC. 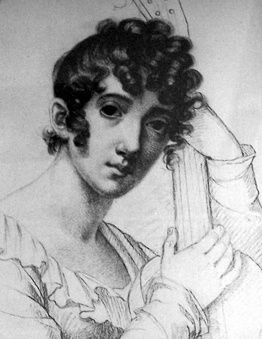 Caroline Bardua was born in Anhalt, specifically in Ballenstedt, and studied under the father Gerhard. 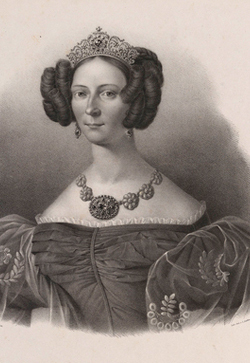 Although she was 20 years his senior, she was more of a contemporary of the son Wilhelm. 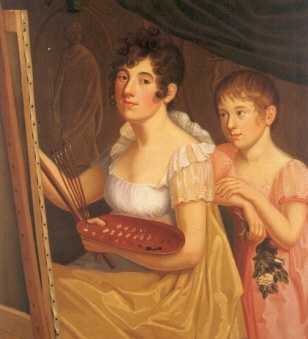 Gerhard von Kügelgen died in 1820 at the age of 48 and Bardua would become a well respected artist in her own right moving easily within the German artistic community. Among her works are several outstanding portraits of the writer Goethe's wife Christiane and Johanna Schopenhauer, writer and mother of the philosopher Arthur Schopenhauer and the writer Luise Schopenhauer (pictured below). 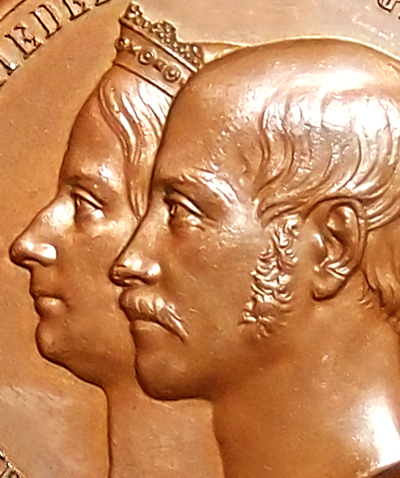 By 1857, the date of the issue of this Honorary Medal, Duke Alexander Karl was well into his illness. The Duchess was serving as co-regent (as is stated on the medal) and Wilhelm von Kügelgen was in service to the Duke. Certainly the well known artist and trusted aid was in a position to consult them in such matters and may have had a hand in awarding Bardua, a fellow student under his father, this medal. 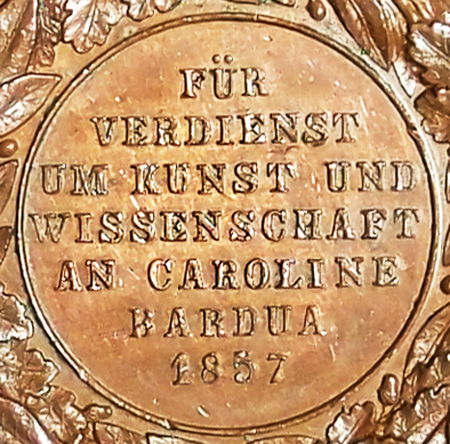 This Medal was awarded to Caroline Bardua for her contributions to the arts in 1857 when the artist was 76 years old, seven years before her death in 1864 at the age of 83. Wilhelm von Kügelgen would have been 55 in this year, he died ten years later in 1867 at the age of 65. As for Duke Alexander Karl, his feeble rule and the disturbed stale of Europe led to considerable unrest with the people who looked for social change. A number of abortive attempts were made to change the government and for a time the principality was occupied by Prussian troops. Leopold of Anhalt-Dessau appears to have taken some part in the affairs of the ailing Dukedom of Bernburg. In 1859 a new constitution was established for Bernburg and Dessau jointly. Alexander Karl did not leave any children and upon his death in 1863, at age 58. The line of Anhalt-Bernburg ended without an heir. The Duchy of Anhalt Bernburg ceased to exist as it was annexed by Leopold of Anhalt-Dessau. Duchess Friederike died in 1902 at the age of 90. She died at Alexisbad, a small spa town founded by Alexander Karl's father, Duke Alexius. The town was popular with the German upper class in the late 19th century for its iron rich waters said to have medicinal properties.